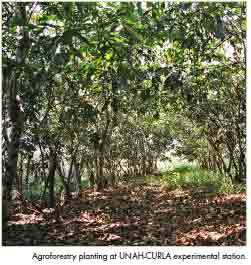 The agroforestry system that has been under development at UNAH-CURLA for the past six years is an alley cropping system. Alley cropping is an agroforestry practice intended to place trees within agricultural cropland systems. The purpose is to enhance or add income diversity (both long and short range), reduce wind and water erosion, improve crop production, improve utilization of nutrients, improve wildlife habitat or aesthetics, and/or convert cropland to forest. The practice is especially attractive to landowners wishing to add economic stability to their farming system while protecting soil from erosion, water from contamination, and improving wildlife habitat. Alley cropping is broadly defined by the National Agroforestry Center as “the planting of rows of trees and/ or shrubs (single or multiple) at wide spacing, creating alleyways within which agricultural crops or horticultural crops are produced. The trees may include valuable hardwood veneer or lumber species, nut or other specialty crop trees/shrubs, or desirable softwood species for wood fiber production”(http://www.unl.edu/nac/afnotes/ac- 1.txt). The UNAH-CURLA project consists of establishing alley cropping agroforestry systems with the tree legume Inga oerstediana (guama) with plants at 50 cm spacing and rows four meters apart. OtherInga species can be used and/or utilize double rows with Inga spp. and others such asCassia siamea, Callandria callothyrsa, or Gliricidia sepium. Crops such as corn, beans, pineapple, black pepper, vegetables and also forages can be cultivated between rows. To grow these crops it is necessary to prune the guama at least once a year, leaving the leaves in the alleys and utilizing the limbs pruned as fuel for the home and selling the surpluses as a cash crop. The leaf litter decomposes slowly and protects against erosion because it absorbs the impact of raindrops and incorporates nutrients to the soil through degradation processes like those of a natural forest where fungi and bacteria attack the leaves under high temperature and humidity. This nutrient production allows for high and sustainable crop yields, with surpluses that can be sold, without the use of fertilizers, herbicides, or pesticides. Thus the produce grown is eligible to be labeled as organically grown crops. The guama tree has an added benefit of secreting sweet substances that attract spiders, wasps, and ants, which predate on many of the crops pests. The fruit that is produced by the tree are ribbed, cylindrical pods, straight or often spirally twisted, up to 1 m long and 3 to 5 cm in diameter. The pods contain fleshy green seeds in a sweet, white, cottony pulp.Monkeys, birds, and cattle will feed off of the seeds and pulp. The guama tree utilized in the UNAH-CURLA alley cropping agroforestry systems was chosen because of it wide distribution in Honduras and capability of it to being used in all the distinct physiographical regions of the country. In addition, the species grows fast, has a high tolerance of acid soils and a high production of leafy biomass to control weeds and erosion. Since agriculture is the main economic activity in slope communities of Honduras (IICA, 1999). The UHAH –CURLA agroforestry system has promise for utilization as a tool to be used across ecotypes and on steep terrain in Honduras as well as other countries of Central America. It has been determined in Honduras that education and soil fertility are the main factors which affect family income, so programs and policies to combat poverty must focus on increasing education levels, improving soil quality, promote market access and augment opportunities for diversification of income (IFPRI-WURS-PRONADERS, 2003). In the year 2000, agriculture represented 18 percent of the Gross National Product (Banco Mundial, 2002), but yet malnutrition is prevalent in 40 percent of Honduras’ children under the age of five years (Banco Mundial, 2002). It appears this statistic is correlated to the fact that poverty in Honduras is concentrated in the population that lives on slopes and practice slash and burn agriculture, and where 91 percent of the people subsist with less than $ 1.00 US daily (IFPRI-WURPRONADERS, 2003). Corn, beans, pineapple and black pepper have been evaluated as crops grown in alley cropping system at UNAH-CURLA. With corn, yields of 2.0 ton/ha have been obtained and with beans, 1.4 ton/ha. Pineapples have shown similar yields and quality comparable to those grown commercially by the Dole fruit company in Honduras, but without application of chemicals. Corn and bean yields are good considering that an average family of 8 members consume 1.4 ton of corn and 0.4 ton of beans yearly, thus surpluses could be sold and provide additional income for the producers. Fuel wood production from pruning to allow light between rows for planting of crops has reached 6,580 sticks, or 65 loads per hectare. Dr. Valle estimates that this level of fuel wood production would cover family requirements and allow the family to sell the surplus for additional income. He also estimates that one farmer can handle the farming of 2.1 ha of the guama system. At the Food and Agriculture Organization (FAO) project in Lempira Sur in southwestern Honduras, near the border with El Salvador, Dr. Valle reports that a low input sustainable agriculture (LISA) project has increased corn yields from 0.9 to 2.o ton/ha annually, bean production from 0.3 to 0.6 ton/ha and allowed an extraction of 6.7 m3 of fine wood per ha year. Additionally, it increased humidity content of soils from 8 to 23 percent in the dry season, which is an equivalent to an additional 30mm of rain in that period. Soil erosion losses of 125 ton/ ha were reported at the study site without the system (Quezungual), which were reduced to 20 ton/ha yearly with the system, meaning a reduction in loss of soinutrients valued at $397 w/o the system down to $45 with the system. Dr. Valle believes the guama system developed at UNAH-CURLA will even do better at reducing soil erosion and the loss of nutrients. In conclusion, the agroforestry alley cropping system at UNAH-CURLA shows much promise. The system offers an opportunity for farmers to employ a sustainable agriculture system that can be utilized on steep terrain and add economic stability to their farming system while protecting soil from erosion, water from contamination, and improving wildlife habitat. After six years of refining the system it is ready to be tested and added to by small farmers living on the steep slopes of Honduras. In our estimation this system will be a great tool in reducing erosion in steep slopes as well as helping to break the poverty cycle and protect the reef system from non-point sources of sediment erosion. Appendix 5 contains details of a proposal developed by UNAH-CURLA to establish a 10 ha demonstration site at the FUNAVID micro watershed and the funding needed for its implementation.